Jeep Wrangler TJ dashlight work fairly well. You can see the gauges at night without much issue. But, they are boring! Just plain dim white! The latest technology of lighting upgrades is LED's. They are used in countless different products. The stock Jeep Wrangler TJ doesn't utilize this new technology. So, that make for a reason to upgrade anywhere we as Jeepers see fit! 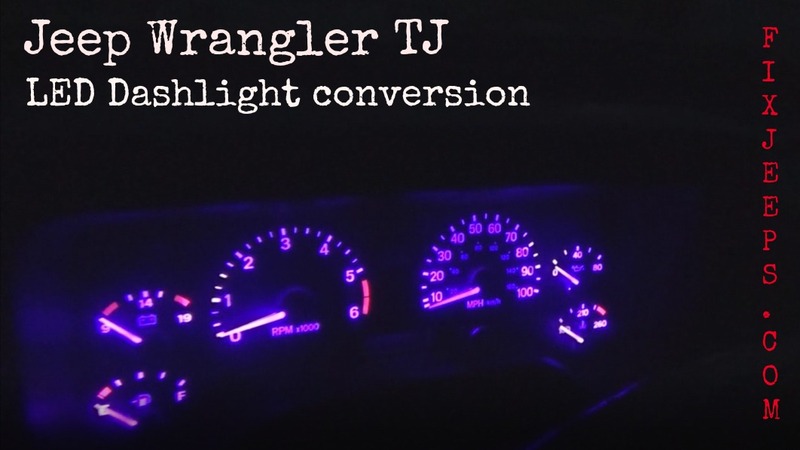 Jeep Wrangler TJ LED Dashlight conversion, going Purple! This 2000 model Jeep Wrangler TJ has been getting a few simple mods here and there. This time it is the dashlights that gets the attention. Pulling the stock boring incandescent bulbs and installing some Purple LED's. As demonstrated in the video below. It is very simple to do this LED conversion. Also, very inexpensive with lots of color choices. Most of all, just darn cool looking!! Bulb base number #74. You will need 8 total. There are 5 in the instrument cluster, then 3 in the heater controls. Click here for you some choices for awesome LEDs.